The QL series represents the '''''next generation' of laboratory power supplies offering an unparalleled level of precision and performance. Voltage and current are controlled using 16 bit DACs enabling voltages to be set to 1mV resolution even at full output. 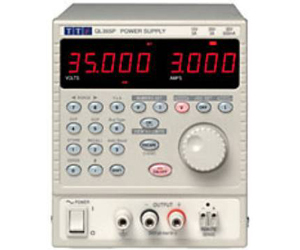 Indeed, the accuracy is sufficient for the PSU to be used as a calibration source for some hand-held DMMs. The QL series uses pure linear technology and offers unrivalled performance in terms of regulation, output noise and dynamics. Line and load regulation are at the limit of measurement. Output noise is less than 350µV rms. Recovery time from transient current pulses is better than 50µs. The QL series provides full remote sense capability via dedicated sense terminals. Remote sense is essential to maintain precise regulation at the load (two 0·03 Ohm connection leads will drop 300mV at 5 Amps). When remote sense is not required, internal local sensing can be selected at the touch of a button. Models with a P suffix incorporate a full bus interface enabling remote control and readback via either GPIB (IEEE-488), RS-232 or USB. On T models, the single interface address controls all three outputs. The GPIB interface conforms fully with IEEE-488.2 as well as IEEE-488.1. The serial interface can be used as a conventional RS-232 interface or as part of a multi-instrument ARC system (Addressable RS-232 Chain). The QL bus interface incorporates a USB connection in addition to RS232 and GPIB. USB represents the future for medium speed PC connectivity and enables multiple devices to be connected. A Windows device driver is supplied which creates a virtual COM port, enabling USB to be used with applications that do not directly support it. Each output is fully floating and is opto-isolated from the bus interfaces. On triple output models the two main outputs can be linked in series or parallel to produce higher voltages or higher currents as required. P versions incorporate output power and sense terminals on the rear panel in addition to as the front panel.